When it was announced that Adam Cohen would be playing in concert in Brussels on August 13th on the free day for us between his father Leonard Cohen’s concerts that we were attending in Ghent we couldn’t resist the chance to be there as it was only an hour on the train between the two cities. Cohen was playing as part of the Brussels Summer Festival in a tent called Magic Mirrors. After arriving good and early so I would be at the front everyone was sitting relaxing when Cohen and his two band members Michael Chaves and Mai Bloomfield came on stage. I was very surprised when everyone remained sitting and initially that annoyed me as sitting on the floor isn’t very comfortable for me. However after a while I came to enjoy this as it added a very intimate feel to the concert and I was pleased to see Cohen had attracted a decent crowd as the act before his hadn’t! Cohen was on stage for an hour and we got to hear songs from his album Like A Man including Lie Alone, Sweet Dominique and Beautiful which he wrote for his son. I hadn’t listened to this album in a while so it was like revisiting an old friend and I really enjoyed it. For anyone who had been at his father’s concert the previous night there were two very special treats awaiting us. After the first song Cohen asked us would we prefer he spoke in English or French and when there seemed to be an equal number if shouts he decided to speak in French so I didn’t really understand what he was saying when he mentioned his father but when I heard him say the words Mike Scoble I was delighted as he is both Cohen’s tour managers and the previous night he had joined Leonard Cohen on stage for Darkness where he played harmonica. 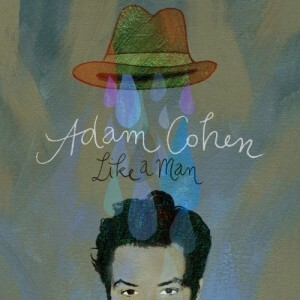 This time he joined Adam Cohen, again on harmonica but this time to perform Leonard Cohen’s song Tower Of Song. As a rule I am not a fan of people singing Leonard’s songs, however for Adam I make an exception as I love him as a singer too and feel that he gets how his father’s songs should be treated! As special as this moment was it was nothing to what our next treat was. Again Cohen was speaking French but when I heard the words Javier Mas I could hardly contain my excitement. 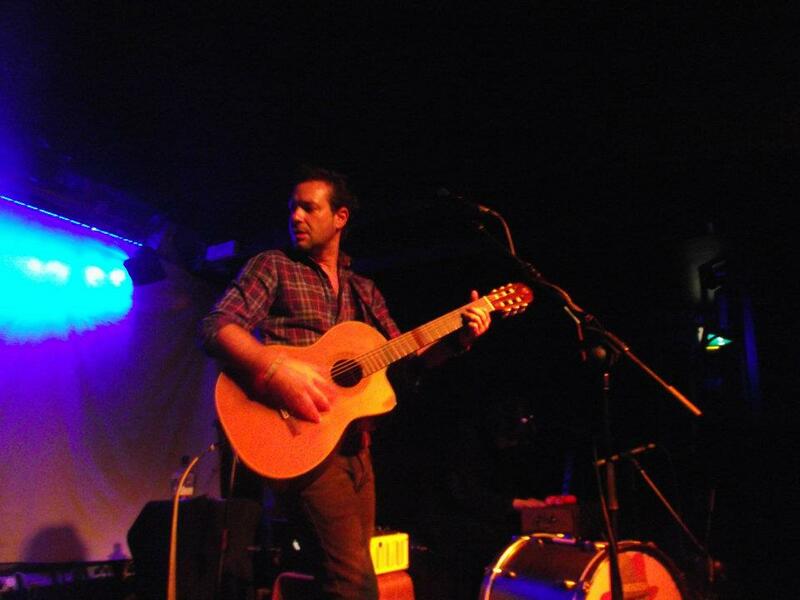 Mas is a full time member of Leonard Cohen’s band and is the master of stringed instruments and is famous in concert at playing amazing solos especially during Who By Fire. He joined Adam Cohen on stage to perform another of his father’s songs and indeed one of my favourites, So Long Marianne. It sounded amazing and watching from such a close location was a very special moment for me. I had spoken to Javier Mas earlier in the day and that added to the magic of the moment. 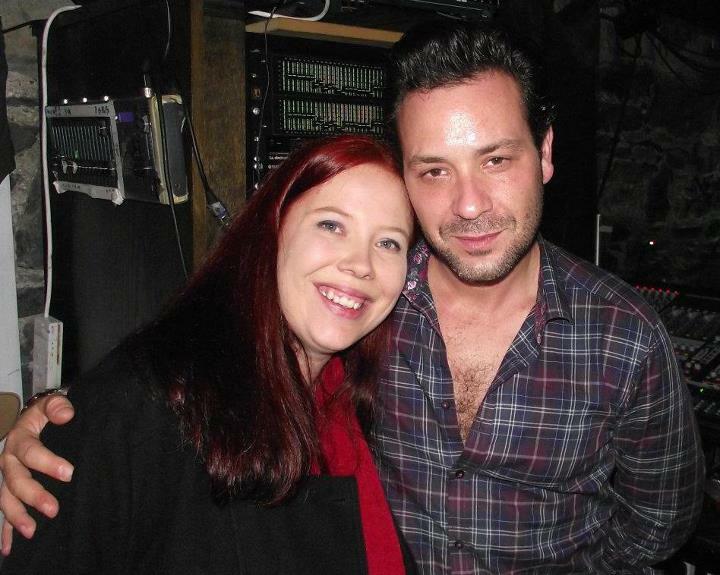 These moments and once again seeing Adam Cohen in concert made for a memorable evening which was topped off after with as he often does a meet and greet with anyone who wished to speak with him. I was very touched when he remembered me from our last meeting. I also spoke briefly to Michael Chaves, a gentleman. It always impresses me how the Cohen’s musicians and crews are as amazing as they are. The whole evening was very enjoyable and we left Brussels to go back to Ghent with great memories to take with us. 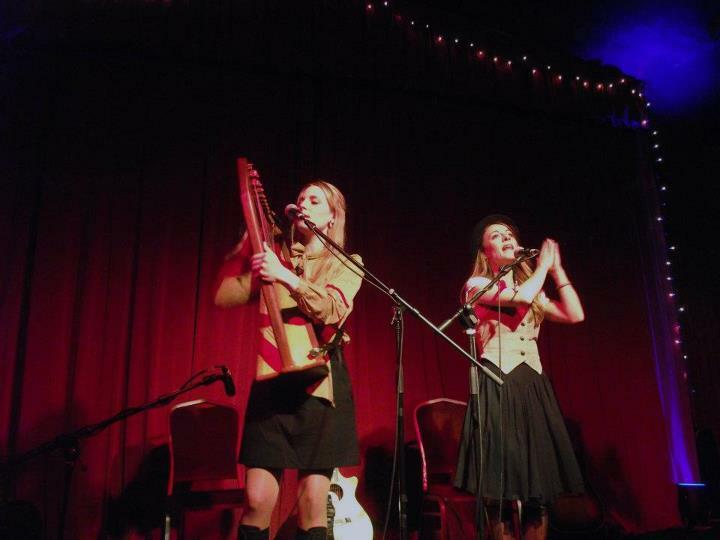 “Sublime” and “angels fallen from heaven” are just two of the descriptions used by Leonard Cohen when The Webb Sisters accompanied him on tour as backing singers on his 2008-2010 world tour. Having being moved to tears by their excellent performances with him I relished the thoughts of seeing them on a solo performance here in Ireland at The Sugar Club on Thursday November 10th. I wasn’t to be disappointed and sublime is a very apt description of the concert we were lucky to witness in what can be described as a very intimate venue. From the opening bars of Baroque Thoughts we knew we were in for a special night. With just the two ladies on stage and with Charley on acoustic guitar and Hattie alternating between a harp and a mandolin this allowed for the ladies to showcase their vocals and I was extremely impressed with their amazing harmonies throughout the entire concert and was moved to tears at times by the sheer beauty of their voices. It is very hard to choose a highlight where every song was performed to perfection and while there were technical issues at the start they were quickly rectified and didn’t take away from the enjoyment of the night. If anything in fact it added to the friendly atmosphere the ladies created from the stage with the audience. Songs performed include In Your Father’s Eyes, Words That Mobilise and 1000 Stars. While most of the songs performed on the night were songs they wrote themselves we were treated to some impressive covers including Tracy Chapman’s Baby Can I Hold You where they were briefly accompanied by Matt McGinn who had provided support on the night. However one specific song was especially poignant for me and that was their cover of Leonard Cohen’s If It Be Your Will. This was always a highlight for me on his tour and I knew I would love hearing it performed in an intimate venue like The Sugar Club. This song was very moving for me as it reminded me of a friend who has recently passed away and I found it very hard to hold back the tears when they sang the lyrics “If it be your will that I speak no more and my voice be still as it was before”. However emotions aside it was as always an outstanding performance of the song by the ladies. When I normally think of beautiful music I tend to think of classical music and especially piano music like for example Fur Elise by Beethoven and I don’t normally use that word when describing concerts I attend. I’d generally use words like impressive or amazing when describing a concert I love. However in this instance I believe the use of the word beautiful is more fitting a word to use as when I was listening the harmonies of Charley and Hattie it was the word which came to mind a lot, that and of course sublime. On every song I was struck by even though they played their instruments to the highest level that their most powerful instrument were their voices. Individually they sound great but it really becomes perfection when they harmonise. Though I have thought long and hard I can honestly say I have never witnessed harmonies of this calibre before with the only possible exception being Simon & Garfunkel. As I’ve stated above right from the start the ladies created a wonderful friendly atmosphere with the audience and even performed the final two songs amongst us. 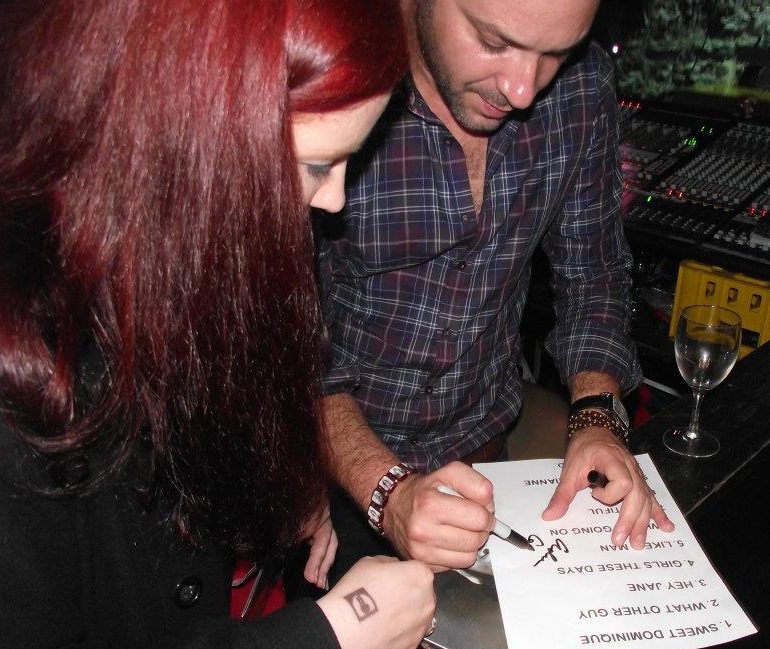 They also very kindly stayed back at the end of the concert to sign tickets and pose for photos. After meeting them in Las Vegas following Leonard Cohen’s final concert of the world tour it was great to have the opportunity to meet them again and thank them for a very memorable and moving night. Leaving The Sugar Club I felt privileged to have being there to witness the magic of Charley and Hattie Webb and I look forward to seeing them perform again in the future. 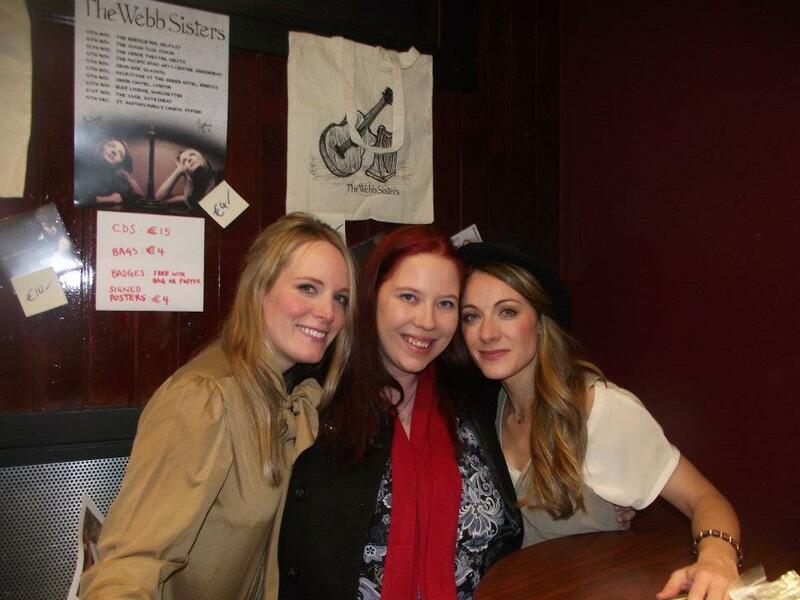 Leonard Cohen was right on target with his description calling these ladies The Sublime Webb Sisters. Meeting Leonard in Las Vegas. 12/12/10 is forever etched in my heart as the day dreams come true, the day I met Leonard Cohen in person and was able to thank him in person for the effect he has had on my life. Such is the effect the moment I laid eyes on him that morning I began shaking from head to toe knowing that I Gwen Langford was going to be speaking to my hero in person. There were 4 of us there that morning and while I waited my turn I kept thinking to myself “Is this real”? When it was my turn I had my book of The Lyrics of Leonard Cohen opened to the page with Hallelujah where I had a photo and my concert tickets and a fridge magnet inserted and asked Leonard would he mind signing just one ticket and the lyrics. Leonard ever the gentleman signed everything. I explained that Hallelujah is my favourite song of all time and while I watched him sign the lyrics to me, watching the hands that wrote the songs that have changed my life I was delirious with joy. I told him his music caresses my soul and he liked that comment thanking me and telling me I was so kind. I also had with me my flag I had made for Katowice. When Leonard saw it he was really impressed and then signed it for me. All the while this was happening my friend Mandy was taking photos for me for which I will be forever grateful. After Leonard then spoke to her and moved on we stayed at a respectable distance not wanting to be a nuisance. Then his manager Robert Kory came out of the hotel and came over to speak to us. I asked him if possible for Leonard to come back on tour and to come to Ireland and if he wasn’t up to the travelling he could just stay in Ireland!! After Robert left us we could see Leonard and him leaning on a wall talking when suddenly and my favourite moment of all, Leonard approaching us and telling us we were so kind. We told him he was the kind one. While he signed one more item for Mandy I told him about when I had gone to Lissadell in September for his birthday with the plaque. He was visably touched when I told him about this. The previous night in the hotel we had met The Webb Sisters and also Dino Soldo so we more than delighted when we met Leonard too. Las Vegas is a strange place, unmagical when described by Leonard but for me it will always be remembered with fondness as the place I met my hero. As a teenager Leonard Cohen practised hypnotism, and I sometimes wonder is that what he does to us at his concerts, as no matter how many times I’ve seen him live I always feel compelled to go again. I’m happy to be under this spell though as it meant I have had the best experiences of my life. Having this year alone previously seen Leonard in concert here in Ireland and also in Poland I decided I just had to attend the final two shows of the tour, so it was off to Las Vegas for only my second ever time out of Ireland. Poland had being the first, such is the impact Leonard has had on my life. Since the concerts at The Colosseum in Caesars Palace Las Vegas were the final two shows of a mammoth three year tour I just knew I had to be there no matter what the sacrifices I’d have to make. The first of the two shows took place on Friday December 10th with the final show taking place the following night. Both nights saw almost identical set lists with the only exception being the addition of Born in Chains on the final night. However no two Leonard concerts are the same, regardless of set list and while always brilliant, each night had its own special moments and memories. On the Friday night on entering The Colosseum, for the first time, I was very taken with the design and how compact it looked. It seemed incredibly small for a venue which can hold up to 5000 patrons. I was almost at the rear of the venue for the Friday show but I felt like I was close to the stage! Leonard and his wonderful band entered the stage shortly after 8pm to a wondrous applause from a delighted audience, where there were many who like myself had travelled thousands of miles to be able to witness the magic at the end of the tour. Hearing the familiar sounds of the now traditional opening song at a Cohen concert, Dance me to the end of Love I sat back relaxed and was all ready to enjoy what I knew would be over three hours of entertainment to come. As always Leonard and his fantastic band performed to the highest level. It is a testament to Leonard of how well he is respected in the industry that he can attract great musicians in their own right to go on tour with him for three years. The mutual love and respect they all have for each other is there to see and really adds to what is already a perfect formula. During all of the many solo parts for each musician Leonard stands there, hat removed head bowed listening intently, appreciating every word and every note. Even though this is a familiar sight to my eyes it never fails to move me or to impress me. In all the concerts I attend I’ve never seen this high level of mutual respect before, except in an actual band situation. Lead singers may command respect but I’ve never seen it returned in the same way as Leonard returns it. I find it hard to pick individual musical highlights as I love all the songs, and when each is performed to perfection it is almost impossible to choose individual favourites. However as always for me Hallelujah was a standout moment, bittersweet that while I knew I’d hear Leonard perform it again the following night, the end was nigh. Other standout songs for me from the first night include My Gypsy Wife, a spoken rendition of A Thousand Kisses Deep, which was unfortunately nearly ruined for me when a woman nearby started moaning really loudly. While initially funny it did become an irritant after a while. To my ears and those beside me it sounded like moans of pleasure, however while talking to a friend after the concert he told me a woman fitting the description I described was being taken off on a stretcher! Another song which was extra special was the solo performance of Boogie Street by Sharon Robinson, who had being absent for some European dates due to illness including the concert I attended in Katowice. I was very happy to see her return and as always her vocals were impeccable. Sharon has co-written many of Leonard’s recent songs where of course he has supplied the lyrics and she the music. Along with the aforementioned Boogie Street two of these songs include Waiting for the Miracle and In My Secret Life. I absolutely love the melodies of both these songs so Sharon will always be held in high respect, and I was delighted to see her back and looking and sounding fantastic. Non-musical highlights included when Leonard described Las Vegas as an unmagical place, and a curious place. It does seem a strange place for Leonard to perform as everything is very over the top and extravagant, which are descriptions which one could never use when describing Leonard . Usually he introduces Anthem with saying how lucky we are to gather in this privileged place while so much of the world in plunged in chaos which he did indeed return to for the final show, but we appreciated the change for one night only! It made his line in Anthem “There is a crack in everything” seem more poignant than at any of the previous concerts I’d attended. At the end of this song as it is always the end of the first half Leonard introduces us to his wonderful band. Always eloquent in his introductions it is a part of the show I love and each band member in turn is described in a wonderful way like when he introduces his musical director Roscoe Beck as the pilgrim of perfection. However in recent shows he has taken to giving drummer Raphael Bernardo Gayol an extended introduction. While I had heard about it I hadn’t seen it before the Friday night show. My favourite quote from this new extended introduction was when Cohen called him the drummer in the quietest rock and roll band around! Another personal highlight from the Friday show was during Leonard’s thanks at the end of the show. While thanking the fans he acknowledged that many of us had travelled long distances to be there and he couldn’t describe us as fans, that it was more than that. This touched my heart and it most certainly true that I don’t just love Leonard for his wonderful songs, it is indeed more than that! While I thoroughly enjoyed the Friday concert the Saturday one simply blew me away. I don’t think Lissadell will ever be topped for me but this has come very, very close. Right from the start there was a raw energy to everything and the atmosphere was electric. We knew we were in for a very special night but we also knew this would be the final concert for the foreseeable future which meant emotions were heightened right from the off. This could be seen on stage too where everyone seemed to be pushing that little bit extra. It brings new meaning to the phrase 110% as that is what it felt like they were giving. Nearly every song ended with a standing ovation at the Saturday show from most of the audience. The first song of the Friday show to achieve this was Hallelujah which is performed in the second half of the show to put this in perspective. There was a very special moment when during the last few minutes of the interval a section of the fans started singing Passing Through and when Leonard came out on stage after hearing the fans he sang a line from it for us. For the final show it had being arranged via email to get as many women as possible to wear something with polka dots for the final show in tribute to the lyrics of Closing Time. While I did indeed have a headband on I was too far back to be seen from the stage but it was great to see people waving these items over their heads during the song with some people throwing them on stage! As mentioned earlier in this report Leonard performed Born in Chains on the Saturday night. Having not been performed the previous night I was very pleased to hear it. There are solos from Sharon Robinson and individual solos from Hattie and Charley Webb. Mixing these beautiful singers with Leonard’s gorgeous voice makes for the most wonderful harmonies and adds such magic to each song. I do love the solos in this song and also when The Webb Sisters sing If it be Your Will as well as the aforementioned Boogie Street by Robinson. All of the band members play an important roll with many solos throughout. I especially love Javier Mas introduction to Who By Fire, Dino Soldo’s solo during Bird on the Wire and a personal favourite has to be Neil Larson’s piano solo during my beloved Hallelujah. I also appreciate the important roles of bassist Roscoe Beck, lead guitarist Bob Metzger and of course the master timekeeper Rafael Bernardo Gayol. Like the Friday night it is is extremely difficult to pick individual highlights apart from of course my precious Hallelujah where on the Saturday night I felt my heart was breaking as I knew it will be long time before I get to hear it performed live again. So Long Marianne is also a personal favourite to hear live and it comes very close to Hallelujah both in my affections and as a personal highlight at each concert. I was very happy when Leonard again recited A Thousand Kisses Deep this time with no interruption. While I love Leonard for his singing of his songs first and foremost, this is an absolute gem when it is recited. Leonard who was first a poet is an expert at recitation. While the end was nigh we really couldn’t ask for more as we were treated to almost four hours of magic with only a twenty minute interval. I really felt for Leonard and his band, for as heartbroken as we were that the tour was over they have spent three years on the road together and the bond between them all is plain to see. There were tears in my eyes as Leonard said his final thanks to everyone involved over the last three years. Now the tour is finally over Leonard is heading into studio to record his twelfth album and first since 2004. If the three songs premiered on this tour, Born in Chains, The Darkness and Feels so Good are anything to go by this record will be amongst the best work he has ever released. Rarely is an artist still at the top of his game in his mid seventies but then Leonard Cohen is an unique entity. After the show on the Saturday night I was lucky enough to meet both Dino Soldo and The Webb Sisters. It was great being able to personally thank them for their contribution to the tour and each show. However nothing will ever beat the moment when on the Sunday morning I actually met Leonard and was personally able to thank him for the effect he has had on my life and for his amazing concerts and that I really do hope he tours again. I also conveyed this wish to his manager Robert Kory who promised he would do his best to make this wish happen. I say thank you to Leonard Cohen,his wonderful band and crew and will be forever grateful to have being there to witness the magic. For now, I say until we meet again, So Long Leonard Cohen it has being a pleasure to attend these concerts. When the announcement was made that Leonard was to perform it was suggested via the Leonard Cohen Forum that a Canadian Maple be planted in his honour in Sligo town. However this was later decided to be located in the grounds of Lissadell House. Some of us then decided we would lay a plaque at the tree in Lissadell in honour of the concerts. Mick Purcell deserves all the credit for the work involved in this project and I was honored to have my idea of the Unified Heart included. It was decided that we would put the plaque at the tree at midday on Leonard’s 76th birthday. It was my honour to accompany Mick Purcell to Sligo to do this. We went down the previous day to stay over night and stayed in The Pier Head Mullaghmore which was the hotel Leonard and the band had stayed in when they had the concerts in Lissadell. On the morning of 21st of September as the sun was rising I took an early morning walk as I love this time of day and also because I know that Leonard also likes early more walks and it was my homage to him to do the same on his birthday. It was on this walk I took the photo of the birds on the wires 🙂 It was very special for me when we left the plaque at the tree. Some our Forum friends donated money towards the cause so it was a present from many of us and I hope someday Leonard gets to visit the spot and see it for himself. Leonard Cohen and Lissadell House, surely a match made in heaven was the thoughts that crossed my mind many times over the last few months, as I waited for what could be the most magical concert I’d ever be lucky enough to attend. Leonard having been a lifelong fan of the work of W.B Yeats relished the thoughts of performing there as much as we the fans relished the thoughts of seeing our Poet in possibly the most amazing location possible. Having seen Leonard live last year and that gig being absolutely amazing, I have never before felt so much excitement and impatience in the build up to a gig. Could the tantalising mixture of Leonard and Lissadell really be a recipe for a night we would never forget? The answer to that is a resounding yes! From start to finish this was the most amazing concert I’ve ever attended. Having possibly the greatest poet of our times performing in the place that inspired his hero added a certain magic that I don’t believe I’ll ever witness again in my lifetime. Playing for an impressive 3 hour 45 minutes with only a 20 minute interval Leonard and his fantastic band delivered to the highest possible standard playing the songs we so love to hear, and adding in couple of new songs to whet our appetites for the promised new album due in the spring of next year. Dance me to The End of Love was the opening song of this wonderful night followed by The Future and Ain’t no cure for Love, in what was a serenely mellow first half. I find it impossible to pick a musical highlight for this half since every song is a highlight in itself. The mix of Leonard’s sultry tones and the fabulous musicianship of his incredible band was musical poetry to me ears. However as wonderful as all the familiar tunes were I was delighted to hear the first of 3 new songs, Born in Chains. This new song showcases that even in his mid seventies Leonard can still write great melodies and fantastic lyrics. What I especially loved was that Leonard shared the singing of this song with the sublime Webb Sisters and his extremely talented co-writer Sharon Robinson. My highlight of the first half wasn’t even the music but was when Leonard said he was delighted to be playing at Lissadell and quoting Yeats “The light of evening, Lissadell, great windows open to the south, two girls in silk kimonos, both beautiful, one a gazelle” before quoting what is possibly his own greatest lyric “Ring the bells that still can ring, Forget your perfect offering, There is a crack in everything, That’s how the light gets in”. He then preformed Anthem from which that song lyric came from to take us to the interval. Like the 1st time I saw Leonard live the 2nd half proved to be my preference even though nearing the end Mother Nature treated us to misty rain! My favourite of Leonard’s songs Hallelujah and So Long Marianne were preformed in this half. Hallelujah is in my humble opinion the greatest song ever written and it has to be my ultimate concert highlight hearing it sung live by its creator. Leonard starts and ends this song on his knees and delivered an outstanding performance that even though familiar to my ears gave me Goosebumps and had tears streaming down my face. Even now as I’m transported back to that moment I find my eyes filling up. Hallelujah aside, like the 1st half it is extremely difficult to pick individual highlights because everything was sublime. I am probably starting to sound like a cliché but I’m overwhelmed by the intensity of this amazing experience and feel so lucky to have witnessed this magical encounter. It must be noted how brilliant Leonard’s band is. During various moments during the night we were treated to solos form most of the band including Dino Soldo and Javier Mas. As mentioned before as always Leonard’s backing singers, The Webb Sisters and Sharon Robinson were outstanding. The mutual respect between both Leonard and his band is plain for all to see and adds to what is already an excellent ambiance. Even after the incredible 3 hours and 45 minutes Leonard who will be 76 later this year was still in top form but there had to be an end and it was a touching end when he performed Lover, Lover, Lover which wasn’t even on the setlist. Other songs of note during the night included Famous Blue Rain Coat, Suzanne, In My Secret Life, First we Take Manhattan and I’m Your Man. It was a special moment for me when my friend who accompanied me to the concert started cheering after this song even though she isn’t a massive fan. I know I could have easily listened for even longer to the concert but respect to Leonard that at his age he puts younger artists to shame and maybe they should take note on how to deliver a night of perfection where it is impossible to find fault in anyway. The interaction between us and Leonard, and also among the fans helped make this a night never to be forgotten. There was a big contingent of the “Leonard Cohen Forum” at the concert with over 90 of us having specially made name tags in honour of the special occasion. This interaction with people who are strangers showcased the magic and lure Leonard has among his faithful followers. As I walked out of the Lissadell estate I had feelings of utter happiness and sadness mingled in. Happiness that not only did the gig live up to expectation but managed to surpass it in every possible way but sadness that what will possibly have been the best concert I will ever attend was over. I thank Leonard Leonard for the music, the lyrics and for being such an amazing human being and sharing himself with us and I also thank the Cassidy family for allowing this fantastic concert to take place in their front garden. I and all the other fans will be forever indebted to their generosity.